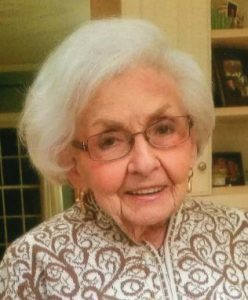 LEWISTON - Rosemarie Cote Butler, 91, died peacefully surrounded by her loving family at St. Mary’s d’Youville Pavilion in Lewiston on Jan. 18, 2019. LEWISTON – Rosemarie Cote Butler, 91, died peacefully surrounded by her loving family at St. Mary’s d’Youville Pavilion in Lewiston on Jan. 18, 2019. She was born in Lewiston on March 14, 1927, to her beloved parents Judge Adrian Cote and Florence (Doucette) Cote. A graduate of Lewiston High School, she continued her education at LaSalle Jr. College in Massachusetts graduating in 1947, and then earned her BS in Social Work at Orono in 1949. Extremely progressive for her time, she worked as a social worker in Bangor for three years until marrying the “love of her life,” “her fella,” John T. Butler. They were married at St. Patrick’s chapel in Lewiston on June 13, 1953, and had five children. Rosemarie was not only an incredible mother, she also dedicated her life to community service while helping her husband build a successful business, Butler Bros. She was always concerned about giving back to her community and as a result was heavily involved in organizations such as the Lewiston Charter Commission, Lewiston School Board, Franklin Pasture Committee, Girl Scouts, PTA, and many, many others. As a lifelong Republican with an interest in politics, she decided to run in 1980 for the Maine State Senate. She was narrowly defeated, but it sparked in her a continued passion for the Maine Republican Party and she worked tirelessly for many national and local campaigns. She was always the “go to person” in Androscoggin County when candidates needed something done. She was a delegate at two Republican National Conventions and served as National Committeewoman. Her family is certain that her legacy has had an incredible impact on many. Rosemarie lived life to the fullest and touched many lives. She always stressed the importance of family and keeping everyone together. She was not only a great matriarch to her own family, but also to many friends, nieces, nephews and cousins who lost their own parents too early. A beautiful woman with an incredible sense of fashion, Rosemarie loved the arts and instilled in her children a profound love of music and theater. She had an intense love for the state of Maine and in particular Old Orchard Beach where she spent a lifetime of summers reading and sunbathing on the beach. Rosemarie was predeceased by her siblings, a brother Paul Cote and his wife Joan and a sister Adrienne Emmi and her husband Tony. They were extremely close and made many wonderful and cherished memories together. She will be remembered lovingly and missed by her husband of 65 years, John T. Butler; and her children, Shaun Butler and husband Ray Harris of New York City, Kathleen Butler Simpson and her husband Steve of Lewiston, Patrick Butler and his wife Patricia of Portland, John T. Butler, Jr. and his wife Ann of Lewiston, and Mary Lou Harris and husband Tim of Lewiston. Rosemarie is also deeply loved by all of her grandchildren and step-grandchildren who brought so much joy to her life. They include Jamie Caouette, Nik Caouette and his partner Nongnuch (Kum) Makarom, Jason Butler and his wife Titayawan (Fon) Butler, Tori Butler Doucette and her husband Jeff, Alexandria Butler and her fiancé Michael Paradis, Michael Butler, Matthew Butler, Andrew Butler, Jonathon Powell, Ashalie Harris, Jessica Harris and Corey Harris. In addition, she loved her six great- grandchildren, Madison, Natalie, Braden, Zhylis, Chama, Jorah; and two beloved dogs Vegas and Izzy. The Butler family wishes to express sincere gratitude to her care givers at St. Mary’s d’Youville Pavilion for the time she was there, as well as the staff from Beacon Hospice who gently assisted the family with her “end of life” care. Visiting hours will be held at Fortin\Lewiston on Thursday, Jan. 24, 2019, from 3-5 p.m. and 7-9 p.m. A Mass of Christian Burial will be celebrated on Friday, Jan. 25, 2019, at 11:00 a.m. at Holy Family Catholic Church at 607 Sabattus St., Lewiston. Arrangements are under the care of The Fortin Group Funeral Home, Cremation and Monument Services 70 Horton St. Lewiston, 784-4584. In lieu of flowers, please consider making donations to one of the organizations important to Rosemarie.